If you've ever come home to a dog, you're probably all too familiar with the face-licking, tongue-whirring brand of welcome they specialize in. Rinse, rinse, rinse and then repeat. A dog's incredible passion for our comings-and-goings is unmatched. But what happens when you bottle that passion, engineer it if you will, into some kind of love bomb? Perhaps, delay the reveal until the dog is at peak what-the-hell-is-going-on mode. And then, bang. Well, as this guy so powerfully demonstrates, all you need is a blanket. 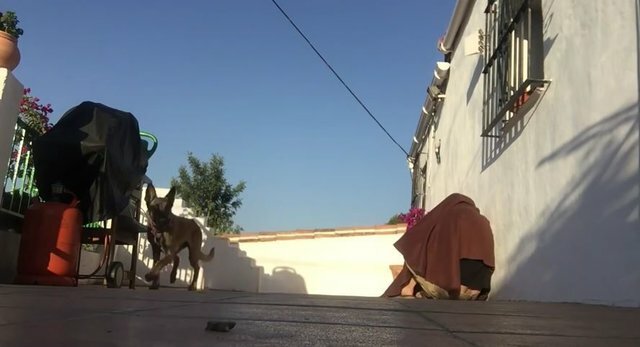 In a video, posted on The Chive, a man returns from vacation and quickly hides under a blanket. His faithful friend doesn't realize he's back, but he knows something's up. First, he hears his owner whistle. The dog wastes not a second in appearing, massive green toy in mouth. Then he sees the lump under the blanket. He sagely drops his toy. This may be a real situation, requiring him to be a serious dog. He creeps ever-so-tentatively up to the blanket, tail at half-mast. Could it be ... ? And then, when neither human nor dog can contain himself any longer, a final clear whistle. This is what coming home to a dog is really all about. When they tell you they love you, and that love is a thousand licks deep. It's messy. Things break. Hearts are mended. And please-never-leave-agains are very strongly suggested. Yes, your dog loves you very much.